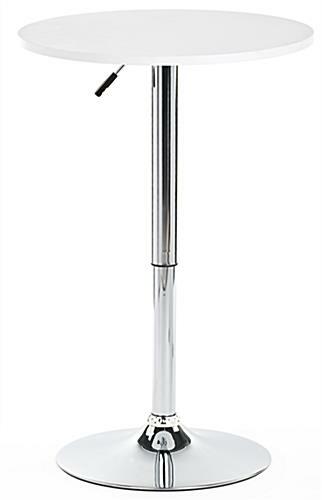 Adjustable in height between 27.5” and 37.5” for counter to pub size. Tabletop made of MDF (medium-density fiberboard) for a long lasting design. 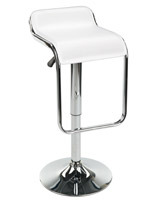 White top and chrome base for a contemporary appeal. Lightweight and portable to transport to different venues. 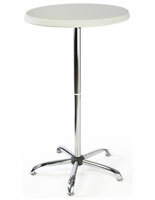 This high top dinette, white bar table is an economical choice for function venues. Rather than spending a bundle on rental furniture, this highboy counter is reusable and matches a variety of room schemes. 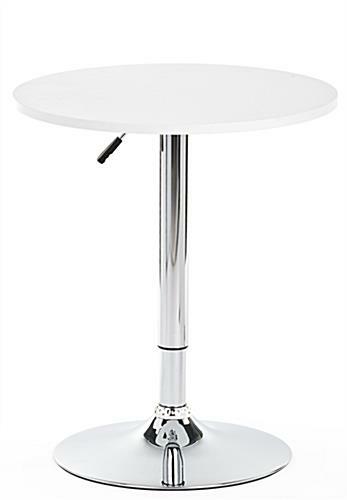 This round white bar table has a narrow design so that there is plenty of room for larger units during a function. This pedestal allows guests to walk around freely and mingle with each other rather than a bulky, traditional furniture set. This white bar table provides counter space at special events. This dinette is the ideal size for guests to socialize around. 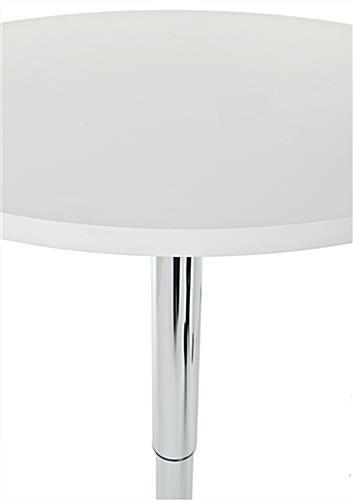 This white bar table that is contemporary furniture can also be paired with a variety of stools found on this site to create a complete dining set. 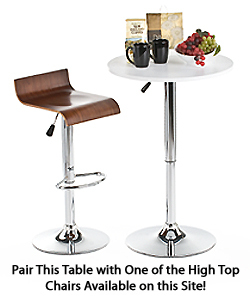 This dinette is a great alternative to conventional sit-down dinner service. 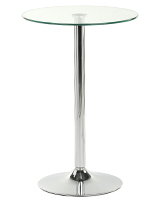 This chrome finished white bar table provides a casual setting for guests to mingle. 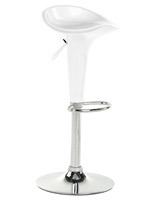 This pedestal will look great in any booth during an exhibition, convention, or other special events! 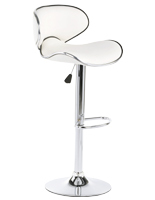 Display company or product information and arrange stools around the white bar table that is for trade shows to ring in guests for networking. What’s more is this tabletop is lightweight and portable to easily transport to different venues or move around a room for different displays. 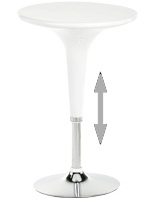 This white bar table, called event furniture, is adjustable. 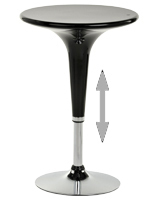 Height can be modified by a pneumatic lift and alternate between 27” and 36” tall. 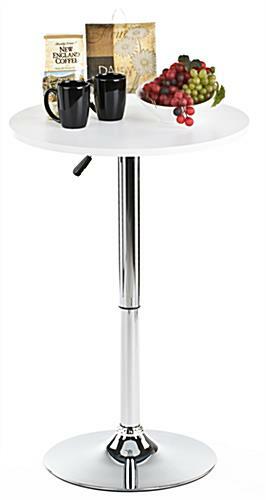 This White bar table that is counter or pub height can also spin 360° to display different products or information on either side without having guests move around the counter. 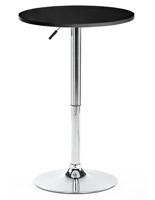 Pair this round tabletop with a couple of high top stools found on this site to give a warm charm to event displays! easy to assemble and good quality! Thanks for the great review, Jacob! Super easy to set up and looked great in our booth! Thank you for the great review, Mae! We strive to provide products that are high-quality and easy-to-use, and we're so happy to hear that this cocktail table looked great in your booth. We hope you shop with us again soon! The table was delivered in a timely fashion. It is the right size and look and it was fairly easy to assemble (taking the plastic cap off the shaft did prove challenging). But, now that it is together, I can not seem to lower it? 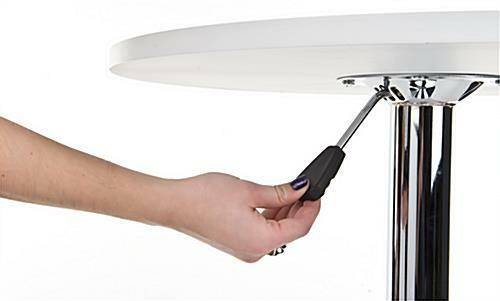 We're sorry to hear you are experiencing trouble with the height adjustable feature of your table, Mia. A customer care specialist will be reaching out shortly to walk you through how to work this functionality. Thank you for your patience. This is one of my best purchases over the web. It was easy to install, looks great, study and the price is right. Thanks for the great review! We're so glad this table worked well for you! I also purchased one from Wayfair. I love the mechanics of this one much better. The hydraulics feel good and strong. Thank you for an affordable table! My only wish is that there would be a taller option. That is why I also bought one from Wayfair, but the Displays2go one is better built.